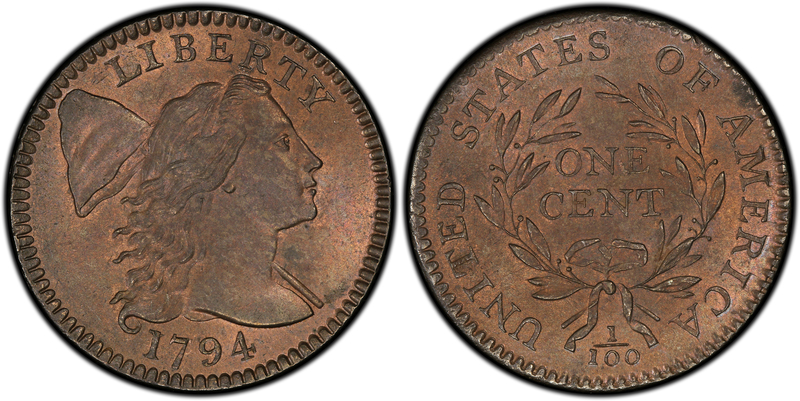 The Lord St. Oswald Collection contained 25 U.S. Large Cents, all dated 1794 except for a single, average-grade 1793 Chain Cent. The 1964 Christie’s sale offered 22 Large Cents; only three appeared in the 1992 sale. Fortunately for future researchers, the catalogers at Christie’s attributed all of the Large Cents by Sheldon variety numbers. Today, we know the whereabouts of most of the coins and their “modern” grades, all of which is revealed below. For purposes of brevity, the Lord St. Oswald Large Cents will be presented in groups of five coins over five installments; this is the fourth installment of the five. Analysis: This was one of three S-69’s in the Lord St. Oswald sale. 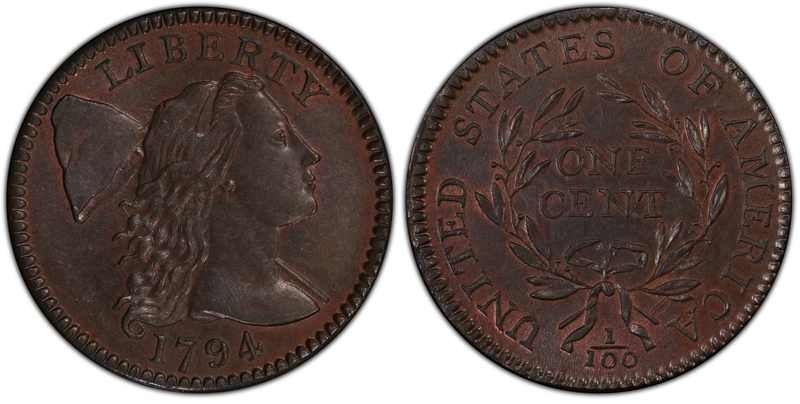 The coin is a gorgeous, glossy brown color, with ample traces of original mint red (so much, in fact, that when it sold as part of the Husak collection in 2008, the catalogers expressed their opinion that it should have been graded Red-Brown). This particular example is listed as Finest Known by both Noyes and Breen/Bland. At the 1964 sale, Spink and Son of London purchased the coin for the equivalent of $8,400. Shortly thereafter, it entered into the collection of Dorothy Paschal, then went to her collecting compatriot, Dr. William H. Sheldon, then to mega-collector Ted Naftzger. This coin appears not to have been a part of the big deal Naftzger sold to Eric Streiner in 1992; rather, it was sold privately to Walter Husak in 2001. In its last appearance in 2008, it sold for $109,250 as a PCGS MS65BN. Analysis: The second of three S-69’s in the Lord St. Oswald Collection. This piece has more red than the previous lot, but is not quite as glossy. As a result, the buyer, Lester Merkin, was able to snag it for considerably less than the preceding lot. He held the coin for the next 13, eventually selling it to Andy Hain (who is best known for his collection of New England and Massachusetts silver coins). Eventually, the coin found its way into Ted Naftzger’s collection. Both Noyes and Breen/Bland called it the second finest known. PCGS certified the piece as MS65RB (Red and Brown). Analysis: This was the third of three S-69’s in the Lord St. Oswald Collection. Lester Merkin purchased this coin for the equivalent of $1,680, held it for just shy of four years, then sold it for almost twice what he paid for it. In subsequent years, it bounced around between auctions and collections, finally selling in a Stack’s auction in 2002. Currently, it resides in the Turissini Collection. 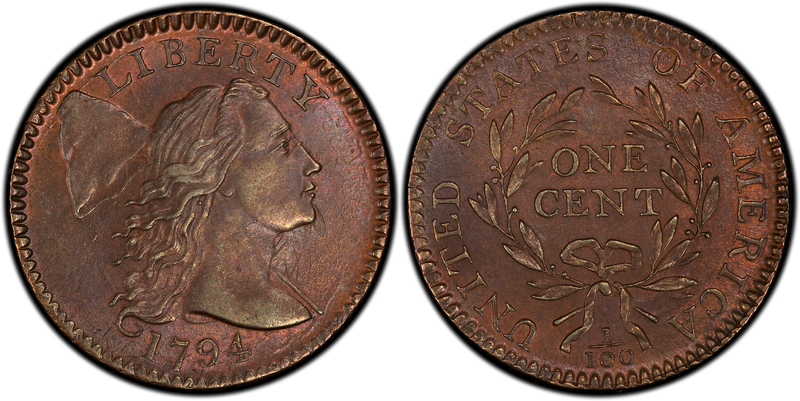 Both Noyes and Breen/Bland considered it to be the third finest example of the variety (as an MS63 Brown), but PCGS certified it as the finest of the three (as a PCGS MS65+RB). Analysis: This was the only S-70 in the Lord St. Oswald Collection. Noyes and Breen/Bland both considered it tied for Finest Known with one other example, that being the PCGS MS62BN example from the Dan Holmes collection. Unfortunately, the Lord St. Oswald S-70 has some minor tooling beneath IBE of LIBERTY, which limited PCGS’ grade to “UNC. Details, tooled.” The “split in striking” refers to the obverse die crack that runs from the rim, between the T and Y of LIBERTY, above Liberty’s eye and just into her cheekbone. Tom Reynolds was the last owner of record, and his collection (and this coin) were sold in 2016. Analysis: This was the first of three S-71’s in the Lord St. Oswald Collection. With the benefit of hindsight, we can see that the order of the quality of the S-71’s in the sale was the opposite of the S-69’s, which started out with the best coin as the first lot. This example is listed as Third Finest by Noyes and Breen/Bland and is currently in a PCGS MS61BN holder, despite quite a bit of mint red color. Apparently, Walt Husak owned this piece for a short while until 2001, when he upgraded to the finest known S-71 – not surprisingly, also from the Lord St. Oswald Collection (see Lot 166). Tom Reynolds became the new owner of this coin, and he held it from 2001 until 2016.